Anything that's ancient will have an element of history (or possibly even some degree of historical significance) attached to it. By every conceivable social and academic norm of understanding, I'd say yes. I mean, if it's ancient, it's historical, right? That being the case, should the subject be featured on the History Channel (or simply History as it's called these days)? Well, if it's ancient and significantly historical enough, why not? After all, isn't that what history's all about? Ancient civilisations, ancient mummies, ancient art, ancient monuments, ancient artifacts, ancient tales, ancient aliens; these are things we should all learn to appreci.... just a sec! 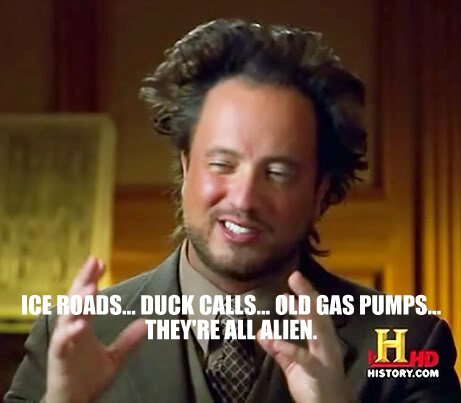 Ancient aliens?!! As you can see, nowadays we're literally swamped ("swamped".... how ironic) by a laughable variety of you-gotta-be-kidding-me reality TV shows, NONE of which carry even a speck of history-related content. To me at least, the channel has become nothing more than a money-spinning channel for pseudo-documentaries and unsubstantiated, sensationalised investigative programming targetted at audiences who are more interested in how much a restored 1957 Treadle sewing machine would fetch at an auction than they are in what sparked off the Second World War. Or how, in all likelihood, their very existence is possible only because of the averting of a full-blown nuclear crisis at the eleventh hour in 1962. 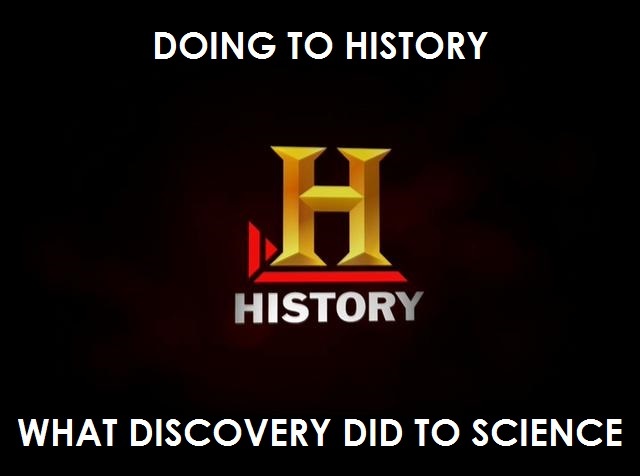 Oh, how I miss those days when the History Channel was actually about history - not UFO's, lazy pawn shop assistants, ice roads, restorers, car pimpers, crocodile hunters, mimicking duck calls and shooting s**t. Of course I could just choose to not watch the channel; problem is, it comes in a package on cable TV which includes some sound documentary channels (The Discovery Channel isn't one of 'em.... not anymore) and I'm paying for it! So c'mon, History; get your act together and give us our hard-earned money's worth of REAL history! Or is that history? What are you thoughts about what I've just written? Do you enjoy watching the current shows on History or do you prefer the history-related programmes of old? Couldn't agree more. Cable TV for me bears no relevance to anything I want to watch. I want my money back, Alister... calculated retrospectively from '09. Disappointing is an understatement, Kay Dee.